Jake's Famous Pure Santa Maria Tri Tip, Rub for steaks and roasts? 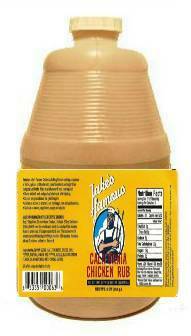 Born on the West Coast California this simple ingredient recipe has been and continues to be a long standing regional favorite. Imagine true redwood oak smoke and chuck wagon grills raising and lowering richly seasoned Tri-Tip roasts with Texas sized garlic bread and ranch style beans. It doesn't get much better than that and these all natural spices and seasonings will make sure you remember it. This is the 3rd in our series of dry rubs. 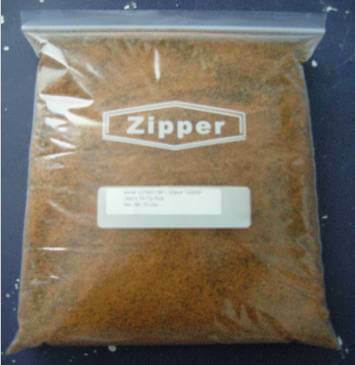 Dry Rubs are designed to delivered powder and granule spices mixing with the moisture of meat being drawn into the fiber in a form similar to capillary action. As the moisture dries the spices are absorbed deeper into the meat acting to marinate the meat and impart flavor. Spices are easy to use and store for longer periods in more places than sauces. The key for spices is will they deliver the same or similar flavor of a sauce without overpowering the flavor of the meat? In most cases salt and pepper are the key ingredients for a great steak. However, salt and pepper cannot deliver the complex flavors that many people seek to parallel the taste of the meat. Our Pure Santa Maria Style Tri Tip, Rub utilizes a number of key ingredients to impart flavor while complementing the existing taste of the meat. We selected brown sugar to deliver a slight sweetness while giving the meat a natural color, coarse ground black pepper, garlic, onion, smoked salt and special hints of spices compliment the marination process. The rub can be sprinkled in or spooned onto meat. The rub is not spicy unless you consider black pepper to be spicy. There is just a hint of natural smoke that does not overpower the flavor of the meat. You can achieve amazing results by shaking on then wrapping the meat and letting it rest in the rub for about 45 minutes to an hour. Grilling is easy just place on a grill with medium to medium high heat at about 225 degrees for slow barbecuing or 275 degrees for quicker barbecue. Of course higher heat requires more consistent watching of the flame to ensure the meat doesn't burn. Our Püre Santa Maria Dry Rub for sale Rub marinates meat producing a wonderful mouthwatering flavor. It takes little to no time to do its job. It produces flavors reminiscent of Central West California, Florida, New Mexico, Arizona, and Kansas barbecues. The rub is perfect for power basting and marinates deeply within 45 minutes to an hour. The rub can be left on for overnight marinating and will deliver a light smokiness and natural color to the meat. Because it's natural it will speed up the time necessary for marinating quickly becoming one less thing to worry about which means you can spend more time enjoying the barbecue and less time preparing it. This Santa Maria Dry Rub for sale will produce the tastiest, juiciest, rich and flavorful Tri-Tips, steaks, ribs and more. 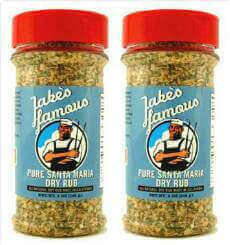 Order Pure All Natural Santa Maria Dry Tri Tip and Beef Rub Now and kick your bbq dry rub skills into high gear. Comes in a clear container with additional sifter that measures 2" diam. x 5" high. Larger sizes are available.